San Diego bicycle accident attorney Frederick M. Dudek is an active participant in Southern California’s bicycle friendly community. Group cycling can be a great way to stay motivated, healthy and social. However, cycling etiquette in California and nationwide constitutes an unspoken code of behavior of which new riders or solo cyclists may not have direct knowledge. Bicyclists can avoid embarrassing circumstances and even dangerous bike crashes by taking time to learn how fellow cyclists communicate. Click here to learn what bicycle terms every cyclist should know. Knowing cycling etiquette may enhance your riding experience and bike safety skills. More importantly, it can keep you and fellow riders from becoming involved in a bike accident. Our San Diego bicycle accident attorney provides this quick guide to cycling etiquette musts when bike riding in a group setting. Maintain predictability when changing bike lane positions or on while on the road. Routine practices, such as using hand signals or making eye contact can help motorists, pedestrians and other cyclists easily anticipate your next move. Obey California bicycle laws, which state that cyclists must obey the same rules of the road as motorists. Riding with traffic is also a good bike safety Some bicyclists claim they feel safer when riding toward traffic. 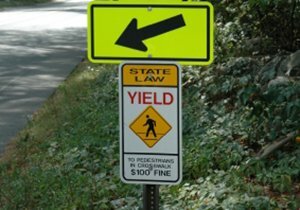 However, this practice not only violates regulations, but cycling towards car traffic also puts you at risk of sustaining more severe bicycle injuries in the event of a crash. Remain cautious when approaching intersections and making turns. Motorists making a right hand turn onto a street may not expect to find a cyclist coming from the right. Proper cycling etiquette also involves stopping for stop signs and staying in the proper lane. In a group cycling situation, always start through an intersection together. Do not zip through stop signs or traffic lights. When other cyclists fail to make it through the traffic light, soft pedal and allow them to catch up with the group. Remove headphones. If you want to turn off a bunch of cyclists, show up to a San Diego biking excursion wearing a cycling cap and headphones. While you may legally wear headphones in one ear when riding, many Southern California cyclists enjoy the relationships they build through group cycling and prefer to keep up a dialogue while riding. Without headphones or earbuds, cyclists can also listen better to their surroundings and for approaching vehicles. Wear a bicycle helmet. California bicycle laws require people under age 18 to wear bicycle helmets. 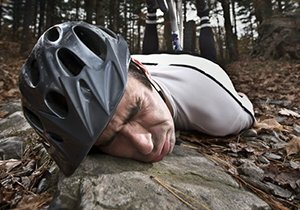 Seasoned cyclists consider it bad form to ride without a helmet regardless of your age, due to the serious risk of sustaining a bicycle brain injury without one. Bike accident lawyer Frederick M. Dudek is passionate about cycling and enjoys sharing his experiences with others. Explore this website for more bike safety tips, information about San Diego’s bicycle friendly community and to learn more about Southern California’s many biking associations, such as the Blind Stokers Club. When cycling in a group, practicing clear body language and demonstrating control over your bike can greatly reduce the risk of a bike crash. Try to keep your speed and line steady, and avoid weaving from side to side or in and out of the pack. When moving to the front, avoid acceleration and maintain a consistent tempo. Other riders appreciate cyclists who exemplify skill and awareness because not only does it increase everyone’s bicycle safety, but it also makes for an easier ride for the cyclist behind you. Another bike safety tip for group cycling is always to maintain control of your bicycle. Stunts like releasing your hands from the handlebars or skipping your bike over objects can cause you to lose control. Sudden braking will quickly make you unpopular with fellow riders. Try feathering the front brakes and continue pedaling against resistance. This technique helps to modulate speed without affecting the trailing cyclist. 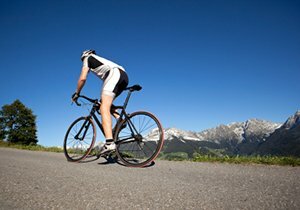 If you or a cyclist you know has been injured in a bicycle accident due the reckless actions of others, contact San Diego bike accident lawyer and cyclist Frederick M. Dudek for a free consultation and advice. Cyclists who take proper bicycle safety measures should not have to suffer financial loss, physical injury or wasted time due to somebody else’s poor choices. 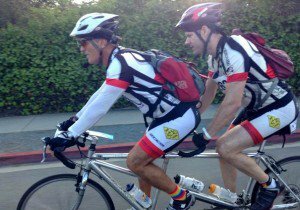 With more than 35 years cycling experience, our San Diego bike accident lawyer knows firsthand the importance of clear and effective communication, especially on group cycling expeditions. Knowing how to communicate to other cyclists is key. 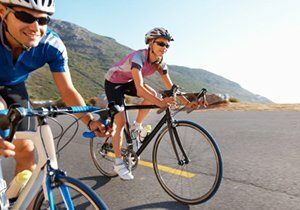 Due to the cycling group riding so closely together, a danger to one cyclist can easily cause multiple bike injuries and collisions among the entire group of cyclists. It is the leading cyclist’s duty to exercise special vigilance around parked cars, other obstacles and to communicate obstructions or turns to the rest of the group. Similarly, it is the responsibility of the rear cyclist to call out oncoming traffic at the group’s rear. This teamwork mentality keeps all cyclists well informed and reduces the risk of a bicycle accident. San Diego bicycle accident attorney Frederick M. Dudek, a bicycle commuter, recreational cyclist and active charity bike rider, offers this information and website as resource to all cyclists throughout California. However, when a bike crash does happen, information about preventative measures that may or may not have helped you avoid your involvement in an accident can only help so much. 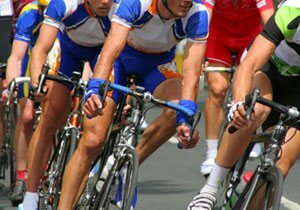 If you suffered a bike injury or property damage in a cycling accident due to a negligent motorist, truck driver or cyclist, contact San Diego bike accident lawyer Frederick M. Dudek for free attorney advice today. He has direct experience with the sport and hobby of cycling as well as what all cyclists need to do to protect their rights after a bicycle accident.